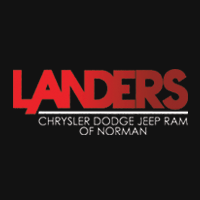 At Landers Chrysler Dodge Jeep Ram of Norman, we are proud partners of Sooner Athletics! We have to give a shout out to our OU teams, who always represent our community so well. From football, baseball, basketball, golf and gymnastics, it’s always a great day to be a Sooner! Keep reading for a few updates on our OU women’s & men’s gymnastics teams. This past meet our girls took down conference rivals Iowa State with a 197.575–196.275 score. Sophomore Anastasia Webb proved to be an all-star athlete as she took home the all around title with a 39.600! Webb also came home with her first floor title of the season with a 9.9. 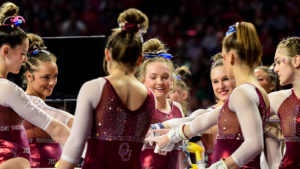 Some of our other all-stars were senior Brenna Dowell, who came home with a spectacular vault title, and senior Nicole Lehrmann and junior Maggie Nichols, who shared shared the bar title after tying with 9.95s. Our Sooners will return home for the final meet of the regular season as they take on No.11 Alabama on March 15th at Lloyd Noble Center. Make sure you tune in to cheer on our OU Women! Our boys saw a dream come true on Senior Day. The OU men topped No. 5 Illinois with a score of 425.700–415.700. 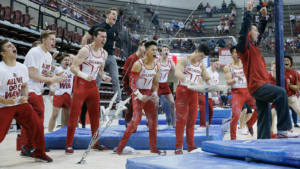 Our OU men won five out of the six event titles and the OU gymnasts won four out of six individual titles, with Yul Moldauer taking home the all-around title with an astonishing 87.150. They didn’t take this win without a fight though! The OU men took their lowest event on the pommel horse in the second rotation. However, Moldauer gained some momentum for the Sooners placing second on the apparatus meet and ultimately taking victory by overcoming the high bars! On March 16, our Sooner men head off to Annapolis, Maryland, to take on Navy for the first time in program history, and then it’s off to Berkeley, California, for a March 23 meet. Our gymnastics team is pretty impressive, huh? We can’t wait to see how the season finishes out!